We feel strongly about providing you with the right music. Songs that are proven to get your guests up and dancing. We can help you choose from a vast selection of music to reflect your personal style. You can utilize our on line planning tools to help you personalize your play list to ensure you and your guests will dance the night away. With our music library consisting of over 50,000 songs you can rest assured we will have the right selection for your event. You can choose from any era...50's and 60's, Big Band, Italian, Latin, 70's, 80's and 90’s, R&B, Top 40, Classic Rock and more! All music is high quality MP3 to provide clear digital sound. We take your requests and “do not play list” very seriously and actually encourage you to give us one. What's great music without great sound? 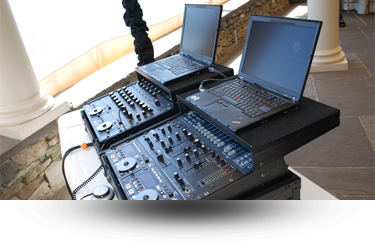 At Executive Disc Jockey, we use sound systems that contain only the finest in professional audio components. Technology has changed since the day of playing records. We embrace that change and keep up with the newest technology. We use only the best software, hardware and digital components for a crystal clear sound that will not go unnoticed. We always play all our music at a comfortable listening level through out the course of the event. All Disc Jockey’s are outfitted with a back up system in the event that a piece of equipment shall fail. 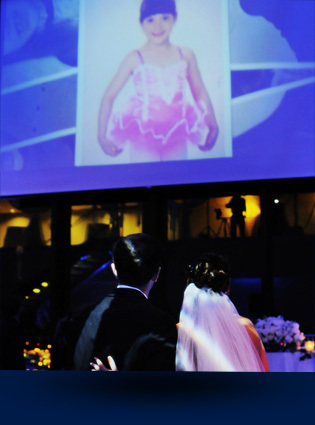 Our Photo Montage video is a great way to bring back some wonderful memories and emotions of you, your friends and family members. You will see them laughing and maybe even getting a little choked up, but most importantly truly enjoying some of the memories you have put together for them to see. This is a great way to give them a small preview of your lives.